For a society in which brands are so pervasive, it seems strange that branding would not have been a major concern for a hedge fund manager up until relatively recently. In the old model the perception was that there was little need for comprehensive and consistent branding, as investors were frequently part of a small and closed group. The market has, however, moved on and these are leaner times. The ability to differentiate the brand has therefore become more important, and branding has come to be seen as a necessary part of that. Living Group has grown alongside this shift, and has, indeed, contributed to it. Kate and Duncan Shaw started the business in 2004, identifying a gap in the market for branding specifically tailored to the financial industry, providing physical design of documentation and presentations, website design and hosting, and, increasingly, social network support. This niche offering was a natural combination of the talents of the two co-founders. 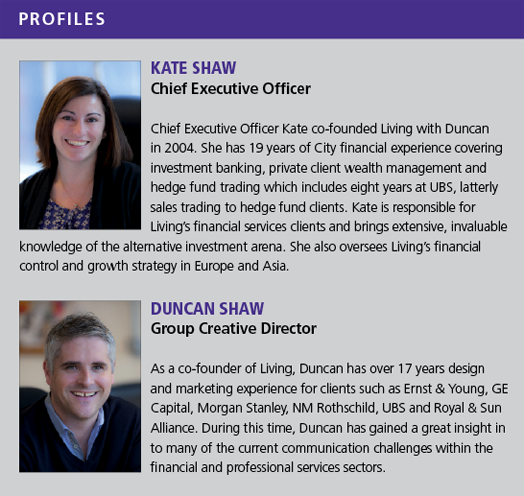 Kate, the CEO, formerly traded risk arbitrage at UBS, while Duncan, the group creative director, comes from a design background and was involved with marketing financial services at Ernst & Young. The ability to understand the hedge fund industry has served them well over the years and has attracted over 50 hedge funds to the company’s stylish offices in Shoreditch. The need for hedge funds to communicate well with their clients has become increasingly more important over the last few years as reduced liquidity and the explosion of social media have turned up the dial on those expectations. Among the company’s clients are not only hedge funds but also big pension funds, prime brokers and hedge fund advisors, giving Living Group a regular insight into what financial decision makers expect of hedge funds. Big investors “are seeing hundreds of presentations each month,” says Duncan. “If you walk in there with a scruffy old power point presentation they will just laugh you out of the door. However, if you articulate who you are, why they should invest in you and what is your trading capability then you have got a much better chance,” he adds. Having a good brand can go a long way in distilling the fund’s trading strategy into short form and making it recognisable in a sea of similar funds, particularly now that they are competing for a smaller pot of money. In the post-financial-crisis world decision-makers have become much more discerning about who they invest with, be it a new fund or a fund manager who has been around for more than a decade. In this kind of climate it has become ever more important for funds to be able to clearly communicate to potential investors not only their trading strategy but also long-term objectives and vision. Big institutional investors are particularly brand-savvy because they invest a significant amount into a retail-facing brand and for them reputation is everything. “It’s not just the pension funds. When it comes to prime brokers it also helps their job to be dealing with a fund with a distinct identity,” said Kate. The financial downturn has made good communication with investors crucial for hedge funds, not only when trying to attract new business but also in retaining it as they had to explain to investors why certain months were not good in terms of performance. Hedge funds that have communicated during periods when they did well and then continued that into the tougher times are the ones that have weathered the financial crisis, said Duncan. Another legacy of the tougher financial times is stricter regulation and an increased demand for transparency. Funds have moved from reporting on a quarterly basis to monthly and sometimes weekly reports, more frequent calls to investors, more frequent performance analysis, due diligence reports and a lot more documentation in general. This is where Kate Shaw’s industry background comes to the fore and what sets Living Group apart from the majority of marketing and communication agencies. “We have Kate’s knowledge of the market and of the hedge fund industry which means that we can look at the reports and understand what is needed. We can reduce the reams of paper and condense a lot of difficult text into a simple form,” says Duncan. Apart from Kate, a number of the company’s staff has either a City or legal background and their regular dealings with legal clients who have to tackle UCITS and Alternative Investment Fund Managers Directive (AIFMD) issues keeps them abreast of regulatory changes affecting the hedge fund sector. Another typical example is the Jumpstart Our Business Startups (JOBS) Act, which was signed into law in the US last year. The Act was designed to help small business and has indirectly affected hedge funds by eliminating restrictions on who hedge funds can advertise to and solicit business from. A lot of funds are still not making use of this new landscape because of fears that they will break rules which were previously in place for marketing to smaller investors. However, the Act is about to broaden the playing field and significantly extend the potential client base for US-based hedge funds. “The JOBS Act could be a revolutionary change in the industry in terms of marketing, but a lot of funds are still quiet reticent about PR because their lawyers are saying that they will not want to be seen trying to gain assets in a non-regulatory way, “ says Kate. One way of addressing the issue of different regulation in the US and Europe is digital marketing and using tiered access for users in different regions. “We can for instance build a website in such a way that we make sure certain information is behind a wall and can only be accessed, let’s say, by users in the US,” explains Kate. This means that a fund manager handling UCITS funds and Cayman-based funds can keep information about Cayman-based funds behind a log-in wall accessible only to certain groups of investors, and information about UCITS funds can be open to a broader base of clients.This approach has the added benefit of providing investor relations with a detailed breakdown of investors’ browsing behaviour – what pages investors or potential investors spend most time on, what is downloaded most – allowing the fund to tailor their offering like never before. The marketing landscape for hedge funds in Europe is also about to radically change. AIMFD, which comes into force in July, will require funds to provide a host of detailed information including the remuneration levels of senior managers, investment strategy and objectives, risks, investment restrictions and legal implications of the investment contract, and will mean that funds will have to update their marketing material and websites in line with new regulation. Living Group’s long-term ambition is to have a presence in all three time zones and cater to clients in Europe, Asia and the US. Their growth strategy started coming together when the company opened an office in Hong Kong in September 2011, on the crest of the economic growth in Asia. Hong Kong is now the gateway for investing in China but also Indonesia and Malaysia. “In the last three years China and Asia have been a massive growth story and European and US investors look to Asia for the next outperforming market,” says Kate. The Hong Kong office deals not only with hedge funds, which are relatively new out there and slightly less regulated than in Europe, but also with individual investors and family offices. One of Living Group’s newest clients there is Bank of East Asia, the largest independent bank in Hong Kong. “Hong Kong is a little bit behind the marketing curve compared with London and to date the hedge fund sector there did not have the institutional set-up investors would be used to,” says Kate. The majority of hedge funds in Asia are still offshoots of European or US operations interested in investing in Asian markets and are targeting Western rather than Asian investors. However, this will change over time and although wealth management is still in its infancy in China, big wealth management firms like Coutts and Barclays are positioning themselves to start attracting those assets. For Living Group, working in Asia required some adjustment to local idiosyncrasies and learning local customs and symbolism. Fund managers there prefer to deal face-to-face rather than over the phone or email and the typically short deadlines for projects are even shorter in Asia. For the founders the adjustment to working in Asia has meant “a lot of early morning phone calls and a lot of long-haul flights,” says Kate. In the long run Living Group wants to be able to offer around the clock services in all the three financial regions and the next step will be to open an office in New York, building on some of the experiences and contacts of the CEO, who worked there in the early ‘90s. The company has not set a date yet for when it wants to open the New York office and will wait for the US market to show two to three quarters of economic growth before deciding to go ahead. In New York there will not be the same gap in marketing as the one in Hong Kong – “We’ll need slightly sharper elbows,” says Duncan. But at the same time it is a much more mature market where hiring a specialist would be familiar. Until then, hedge fund managers interested in some top branding will still have to make a trip to the company’s office in Shoreditch. And given that the office is stylish, like everything that Living Group does, it will be worth the excursion.